At Canberra's Questacon yesterday, it was a Sunday similar to any other in the dinosaur exhibit with a firm spectacle of parents carefully gauging their kids’ responses to the huge, robotic beasts. Typically, while few kids stared up at the animals with looks of fear and surprise, others cringed under the parents' arms, frightened of the looming faces and recorded roars of the Terrorsaurus exhibition. It will arrive as a aid to some, then, that yesterday was the dinosaurs' last day at Questacon, before they start to Victoria. The dinosaurs to Melbourne's Science works was given by “The national science and technology centre". Mr Kohlhagen said,"The kids will be able to get in there and raise a sweat and really physically engage with the exhibits". 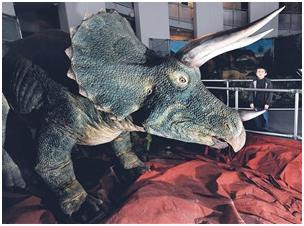 The choice to give away the dinosaurs - some of which date back to 1988- has been seen with shock by parents who have relied in the past on the gripping effects of the bouncy animal movements and bizarre sounds to engage their restless kids.